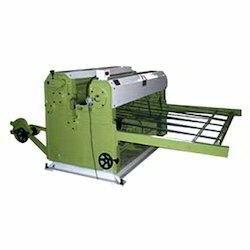 Our product range includes a wide range of paper roll sheet cutting machine. Catering to the diversified requirements of our esteemed clients, we are offering them a wide assortment of Paper Roll Sheet Cutting Machine. This machine is developed by our team of engineers using finest quality metals and components. Offered machine is widely utilized for cutting metal sheets with precision in different sizes and dimensions. Provided machine is reckoned for their striking features such as high durability, tensile strength, exceptional performance and ability to withstand adverse conditions.